Already active in the massive Chesterfield County community, an area homebuilder is donning its developer hat for the next phase of Magnolia Green: a nearly 250-apartment complex. 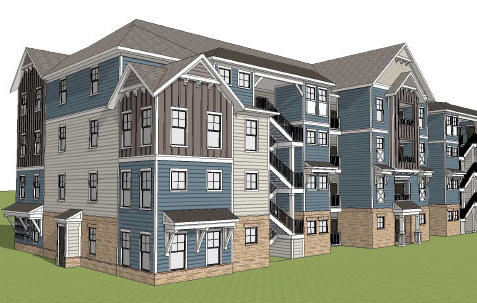 Delaware-based Schell Brothers, which has been building houses in the community since expanding to the Richmond market last year, is signed on to develop a section of apartments that has been on Magnolia Green’s master plan for years. iStar Financial, the New York REIT behind the 1,900-acre development, had previously worked on the section with another developer but those plans never materialized, iStar vice president Tom Page said. “When Schell Brothers came into town and joined us as a homebuilder, they mentioned they had done several (apartment projects) and wanted to do that with us, so we joined forces and are pushing it through,” Page said. Working with Midlothian-based Poole & Poole Architecture, Schell Brothers presented a proposal that mirrors one of its apartment projects in Delaware, said Shane Burnette, division president for Schell. “We approached them with this opportunity and said we think it’s a great time to do it,” Burnette said. Totaling 248 units, the complex will consist of eight four-story buildings and a clubhouse on about 21 acres along Magnolia Green Parkway, across the street from the development’s new clubhouse and aquatic center. The wooden-frame buildings will have open-air corridors and elevators, Burnette said. Floorplans will vary in square-footage and numbers of bedrooms and bathrooms. Specific plans were not provided in time for this story. Burnette said plans remain conceptual and have yet to receive county approval. He said initial meetings with county planners have been positive. Monthly rents have yet to be set, and Burnette said an overall project cost is being determined. He said the company is working with David Blake of local consulting firm Berkadia on HUD financing. A contractor for the apartments has not been chosen. Burnette said three companies are actively bidding on the project. Schell Brothers will not be the builder, he said, working instead with Poole & Poole on design and building efficiency. Schell has been active building houses in Magnolia Greens, where it is working in a section called Palmilla. It is also building homes at The Sanctuary at Roseland, the 55-and-up Lake Margaret section of The Highlands, and is set to start in the Henley subdivision in Glen Allen. Where Magnolia Green consists today of single-family detached homes, attached townhomes and an age-restricted section, Page said the apartments will open up the community to more of the market. He said additional residential types are planned for Magnolia Green, though he said he could not discuss details as of yet. “Our whole marketing mantra has been we’ve got something for everyone, and the apartments help us expand that product offering,” Page said. Added Burnette: “It starts to complete the cycle of the development. Theoretically, you could be a millennial and move into an apartment that’s more of a first-time home product, then you can move all the way up to a million-dollar house and then go back to a senior house. So it completes that life-cycle. Development at Magnolia Green has been ramping up after the project stalled for several years. iStar took over the development in 2009, completing its 18-hole golf course and recently wrapping up more than $11 million worth of amenities including the clubhouse and aquatic center. 3 Comments on "Builder turns developer for Magnolia Green apartments"
There’s going to a lot of competition for apartment living between Route 288 and Magnolia Green. The Winterfield by CMB and the deal by HHHunt are underway. Emerson at Westchester is yet to be approved but it’s coming. Several properties along Route 288 and Hull Street have yet to be announced. It will be interesting to see if such a remote location as MG will be attractive to Millennials. So true Bruce. I mean remote, suburban sprawl with walk ability to surrounding the cul-de-sacs homes and a golf course all off a traffic logged street of strip centers. Even older Millennials buying houses for their new families want to be able to walk to retail and restaurants. This pure 1980s planning at its finest.